Pakistan's authorities have struck a deal with a hard-line Islamist party to end a protest over the acquittal of a Christian woman convicted of blasphemy. 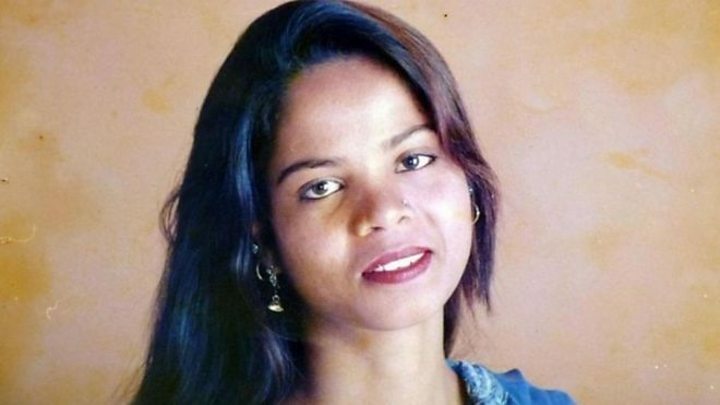 As part of the deal, the government will begin proceedings to bar Asia Bibi from leaving the country, despite warnings her life is in danger. Asia Bibi was convicted in 2010 of insulting the Prophet Muhammad, but was acquitted earlier this week. But the ruling enraged some in the majority-Muslim country. Hardliners who support Pakistan's blasphemy laws have been taking to the streets since Wednesday's ruling. It was reached between the government and the Tehreek-i-Labaik (TLP) party, which led the mass protests, local media report. Under the agreement, as well as beginning legal proceedings to put Asia Bibi on a list which would ban her from leaving Pakistan, the government will also not block a review petition filed against the verdict. The deal also envisages that all protesters arrested since Asia Bibi's acquittal will be released, and any violence towards them will be investigated. The authorities earlier said that Asia Bibi was scheduled for release later this week. Speaking to the BBC this week, her lawyer Saiful Mulook said she would need to move to a Western country for her own safety. Several countries have offered her asylum. What was Asia Bibi accused of? The trial stems from an argument Asia Bibi, whose full name is Asia Noreen, had with a group of women in June 2009. On Wednesday though the Supreme Court acquitted her, saying that the case was based on flimsy evidence and her confession was delivered in front of a crowd "threatening to kill her". Why is this case so divisive? Islam is Pakistan's national religion and underpins its legal system. Public support for the strict blasphemy laws is strong. The vast majority of those convicted are Muslims or members of the Ahmadi community, but since the 1990s, scores of Christians have been convicted. They make up just 1.6% of the population.